Today I’m happy to have Andrew Youderian back on the show and it’s been quite a while. For all of you who don’t remember Andrew, he was a guest on episode #2 where we discussed his dropshipped online store Right Channel Radios and his awesome blog EcommerceFuel.com. As with any small business owner, nothing is ever stagnant. And several months ago, Andrew underwent a gigantic website redesign that not only took a lot of guts but a significant amount of money as well. Fortunately, his efforts were worth it and today we’re going to discuss his thought processes regarding the entire project. What pain points were customers having? Steve: You are listening to the My Wife Quit her Job Podcast. And if you are new here, it’s a show where I bring in successful bootstrapped business owners to teach us what strategies are working and what strategies are not. Now I don’t bring on these famous entrepreneurs simply to celebrate their success. Instead I have them take us back to the very beginning and delve deeply into the exact strategies they used early on to gain traction for their businesses. Now if you enjoy this podcast please leave me a review on iTunes and if you want to learn how to start your own online business be sure to sign up for my free six-day mini course, where I show you how my wife and I managed to make over 100k in profit in our first year of business. Go to www.mywifequiteherjob.com sign up right on the front page, and I’ll send you the free mini course right away via email. Now before we begin I want to thank HostGator for sponsoring the show. HostGator is an incredible webhost that I highly recommend. And in fact did you know that mywifequitherjob.com was hosted on HostGator in the very beginning? They offer 24/7 live support, via chat, phone, and email, one click WordPress install, so you can literally install WordPress blog in a matter of minutes. They have an easy to use website builder, design services, marketing services. And the best part is that I’m offering a 30% discount for all podcast listeners. So please go to HostGator.com/mywifequit to redeem the discount. Once again that’s HostGator.com/mywifequit. I also want to give a quick shout out to my other sponsor Bigcommerce. Now Bigcommerce is a fully hosted shopping cart platform that allows you to set up your own online store in minutes. Now as most of you probably know, I teach a class on how to start a profitable online store and Bigcommerce is actually one of the shopping carts that I highly recommend in my class. Now here’s what I like about Bigcommerce. Unlike other competing platforms, Bigcommerce does not nickel and dime you with every little shopping cart feature. And when you sign up, you immediately have a fully featured and extremely powerful shopping cart at your disposal. There’s also an incredible theme store where you can choose from a variety of attractive store designs, so you don’t really need to hire a designer. And everything from design to payment processing is all built-in, and all you got to do is populate it with your own products. So you can literally start your own online store in a matter of hours. Simply go to bigcommerce.com/mywifequitherjob sign up and you will instantly receive one month free. Once again the URL is bigcommerce.com/mywifequitherjob. Now onto the show. 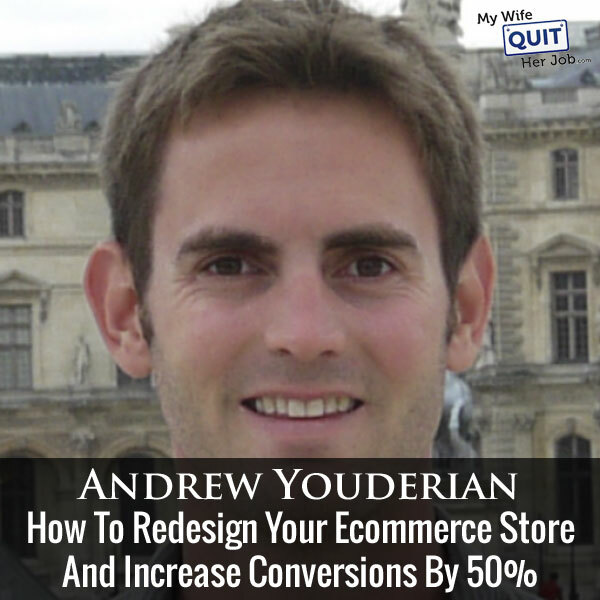 Steve: Welcome to the My Wife Quit Her Job Podcast, today I’m happy to have Andrew Youderian back on the show. And it’s actually been quite a while, and for all of you who don’t remember him, I actually had him back, way back in episode number two, where discussed his drop ship online store rightchannelradios.com, and his awesome blog at ecommercefuel.com. And as with any small business owner nothing is ever stagnant. And several months ago Andrew underwent a gigantic website redesign that not only took a lot of guts, but a significant amount of money as well. And fortunately his effort were worth it and today we are kind of discuss his thought processes regarding the entire project, and just kind of break everything down. And with that welcome back on the show Andrew, how are you doing today man? Andrew: Hey, I’m good Steve thanks for having on, it’s fun. Steve: Yeah, just real quick review if people don’t remember your story, can you just give a quick 60 seconds overview about Right Channel Radio, the business model on what you sell? Andrew: Yes, over there we sell radio equipment for off road and heavy duty vehicles. That’s a business I started maybe seven years ago 100% drop ship, well almost 100% drop ship right now. And yeah it’s kind of the where I kind of teach on ecommerce and what we still run so. Steve: Yeah, so I’m just curious because I know the extent you published a really cool blog post about it, which I’ll post in the show notes, but it was a really huge undertaking right? Your redesigns, so what was kind of the impetus to do it, it takes a lot of guts? Andrew: Yeah, it was a big one; it was a second one for that business, so our first one we went from design cart, do you remember design carts Steve? Andrew: Yeah, I don’t know if anyone is still using them, but that’s where so we launched on — our first one from Zenca to Magento, and it was a really great redesigning in terms of just the conversion and usability, that was about 2011. And since then we started having some growing pains with Magento. I’m not — Steve I know you are pretty good on the technical side, and I’m good enough to just barely get in and break things more or less. I can look at PHP and kind of figure how to tweak things; I can log into Unix server and barely fumble my way around. And some of the issues with magento need to be self hosted, some of — everyone who’s worked with them knows it’s fairly complex cart in terms of maintenance, upgrades, tweaking things, it’s never intuitive. I mean to really be able to use it while you need to get to know it well or be able, or finding and paying someone to maintain it and customize it. So I got kind of tired of trying to be an expert in that, and to having to outsource some of that stuff. That was a big thing. Steve: Did you have a developer on staff, I’m just curious? Andrew: No we had a contractor that worked with us that could do things. Yeah, so he could get in and make tweaks too and changes, but no one was on staff. Steve: So it sounds like the reason why you switched was for shopping cart reasons, or was it for conversion reasons? Steve: Can we just talk about mobile real quick since you brought it up, so what were the conversion rates, and what percentage of your traffic was mobile, and what has been the trend and what were the conversion rates before the switch? Steve: I just want to clarify too mobile I mean like smart phones as opposed to tablets. Steve: Okay, yeah, that sounds normal actually. Andrew: Yeah, what about you, is that what you see too? Steve: Yeah, pretty much, I haven’t actually looked at the stats for a while actually ever since that post I posted a while back. But yeah we were hardened too, and after having a mobile site we pretty much doubled our conversion rate. Andrew: Yeah, and Steve one thing that I kind of worry about is even with — I’m kind of getting off script a little bit, I hope that’s okay? Steve: There’s no script Andrew. Andrew: Right, even with — even when you’ve got — yeah, both of us have done redesigns to implement a mobile theme. And even then your conversion rate on a mobile is half, right? Let’s say you’ve got a great site, it’s half of what your desktop is. And with mobile traffic continued to increase, it’s the majority of my site now I’m guessing in two or three years it makes up three quarters of our traffic. Even if you do everything right, you are still losing out like your conversion rate is trending downward in the best case scenario. Does that worry you, that worries me? Steve: It doesn’t worry me, because what we do is we target on the desktop, so anyone who comes on the mobile site we use like dynamic re-targeting and we get them back. So a lot of people don’t purchase until they reach their desktop. They might do that at a later day, and so — and I would say like the majority of people are either logged in the facebook or some sort of google product. By just keeping them cookied, you can always show them those products later on, so I’m not terribly worried about that. Andrew: Okay, obviously I need to start looking into this. Steve: And not only that, there’s all these payment processing companies like sprouting up where on mobile you could just click a button and instantly check out. That’s going to happen really soon, and once that happens I’m sure all of our conversion rates will go back, so I’m not terribly worried. Andrew: On the mobile side I think apple pay could be — I would love to see apple pay come to the need of browser versus Apps, because I think that would be huge. Andrew: I mean just in terms of check out right from safari on your iphone, or chrome from Google without—again well it could be on chrome, what’s apple pay, but you get my point. Steve: Yeah, I mean if you can imagine it on your cell phone, and then you buy something and it instantly just gets built to your carrier right? Like the ideal situation. Andrew: It would, it would be fantastic. Andrew: It’s my fault; I got us off track, I apologize. Steve: So mobile — okay, so we were talking about mobile, so that was one of the factors and then was your desktop conversion rate dropping as well, was there anything going on there? Andrew: A little bit, but not a time, the lion share was in the mobile, I mean maybe it was down kind of 20% over a two or three year period, but most it was the mobile. Steve: So you could have just bought a magento template that was responsive, right? Andrew: I could have yes, but I feel like when you do that and maybe I made things way more difficult than they needed to be. But I feel when, you do that sometimes you miss out on some of the finer aspects of having a mobile site when it’s kind of cookie kind of approach, or maybe it works for most of them, but it’s not going to be designed exactly for your site. I wanted something given how prevalent mobile has become, that was really fine tuned for our specific theme, and our specific user experience for our customers. Steve: So Shopify that implies that you designed a mobile site from pretty much scratch, and not a responsive theme? Andrew: I’m sorry, it was a responsive theme. Andrew: Yeah, so but we did design it from scratch. So the company we worked with Shopify custom, yeah, they built it from the ground up, for what we were trying to achieve and for our site, and it was all responsive yeah. Steve: And how much actually did you invest in this redesign? Andrew: So we invested it was — all in it was about 50K, that’s what I put in the headline for the easy grab, and there was 30K development cost, and about 20K in staff time and things like that. Steve: Say when you invest 50K clearly you are going to expect a return, right? And I was just curious what — like why did you think that that was the answer, what was kind of like the straw that broke the camel’s back that you needed to do this redesign. Steve: I wasn’t aware of that, so revenues had been declining? Andrew: Oh, that was an enormous project yeah; revenues were down 30% year over year in 2014. Steve: Oh, okay, I didn’t — I missed that piece, okay. Andrew: Yeah, I should have mentioned it at the top, but yeah, so revenues were way down and so that was all the impetus for saying that whoa, what’s the problem, well the problem was mobile on a big aspect, and we also having pin points with magento, so all of these things combined led to the redesign. Steve: I see so basically incremental solution, you did not feel was going to solve the problem, now you need to something more drastic? Andrew: If I had six months I probably made a shape, but I — I just don’t know if it’s my personality or what it is, but that’s kind of my MO for doing things. Steve: So let me ask you this, and I have been curious about what your answer is going to be for this. Like you essentially went from one of the better open source shopping cart platforms to fully hosted. So what are your feelings on like open source shopping carts today? Andrew: I think they are — I have nothing against open source carts, I think in a lot of regards they can be fantastic, because you have full control, you can really tweak things to give them exactly how you want them to be. They are cheaper, well it depends, upfront they’re cheaper. But magento was such a pig of a cart, I mean just trying to upgrade it once was a nightmare, we did — one of the migrations we ended up doing was actually from Magento 1.4 to 1.6, and normally you would just upgrade. But the upgrade process was so flout with problems and things that I didn’t trust, actually being stable on the back end that I just installed the fresh version of magento 1.6.1, and re-built the entire site over [inaudible 00:14:10] directed everything as opposed to upgrade it. Steve: Oh my goodness, okay. Andrew: Yeah, so I think open source there’s a lot to be said for it, and looking at carts like Opencart, the [total cleaner], a little more minimalistic has broaded. I think they are great, but for us I just want to really focus on the core of business, on marketing, on the team, and not so much on the tech side which is why going to a hosted such like Shoppify was something I wanted to do. Steve: So real quick, you’ve been on magento for quite a while; did you feel like anything happened when they got acquired? Andrew: They definitely started pushing it more I think in terms of going to magento, their site it was definitely more of a focus. And for the enterprise edition it was — I think it started at 10K per year, and that was really low, most of them were targeted for 25k to 50k per year licensing fee. So yeah, definitely not something I was interested in paying for a cart. Steve: Yeah, for sure, so let’s delve a little bit deeper into the actual process, because what you did is something that I’ve been thinking about doing for a while, but I’m just terrified of it. So let’s ignore kind of like the fully hosted open source, like the technical aspects. What were some of the main points of the redesign that you wanted to address? Was it mainly just mobile, or was it kind of aesthetics and usability as well on the desktop platform? Andrew: Yeah, a good question. It was all of those things, so mobile was a big part of course. We wanted to rebrand to try to create a little bit more of brand sense that looked a little more professional, I think we were using a logo I created in Photoshop which was pretty ghetto. We wanted to rebrand with copy branding that would kind of go on the branding host here, and preach [ph] for a while, but of course it’s becoming so much more important in today’s world. So we wanted to create a stronger brand presence with our brand, with the copy that we had and the experience we offer customers. So that was part of it, part of it was usability. This wasn’t necessarily the driving factor, but we wanted it to be as easy as possible for people to figure out what products worked for their vehicle, and be able to check out and also fix any usability bugs in our existing platforms. So those were some of the kind of the secondary things we were also thinking about as well. Steve: So let’s go through some of those things in depth. So on the branding side, I’ll just tell you my observations. I noticed that you started putting your face, like did you have a lot more videos, was that the main thing that you changed, or what were some of the other branding focus, things that you did for the site? Andrew: Yes, so we definitely — over the kind of the previous nine months leading up to the redesign we started investing more heavily in product videos, that was one. We put together a very personable about us page, about us video rather on the home page where myself and the sales manager, our front and center are taking about who we are, what we do and giving a personal guarantee that people will be happy when they purchase from us. The copy we really re-wrote all the copy for the site to make it a lot cheekier, this has a real — it’s kind of just an example on the home page. The first line you read it says are you looking for CB radio for your press, I’m sorry but you are in the wrong place. It’s tricky, it’s funny, we — then that kind of carries through all the way from the product descriptions to the email confirmations that people get, we kind of have some really — I have had that kind of funny and cheeky. And people come along, they maybe not, maybe yeah, but they are supposed to hear it. But making those order confirmation, shipping confirmation, emails fine and interesting, so that’s kind of what we did on that front. Steve: I actually watched that about video, and it’s actually very well done, very professional, it looks like you got someone professional to shoot it for you. Andrew: Yeah, thanks yeah, we had a guy here on bossman actually, we looked at a little bit, he is a friend, he is — he films off-road TV series. So a lot of the — some of the stock footage, the bureau was like the vehicles going through the creek in the mud, the overhead flying shot of the land rovers. We were able to just get that footage from him which was really nice. Steve: Okay, I was like, oh my god this Andrew guy is cocky, he is wearing his own branded clothing. Andrew: He going maniac in his own video, who is this guy? Steve: Okay, so on the usability — oh, by the way how do you measure kind of like the effects of that? Andrew: That’s really hard; I haven’t had very much success doing that. For a while we were trying to split test product videos on pages with just using that, there’s always that optimizer. And for whatever reason we were having a lot of problems back and forth with support for a while, that the video embed code was playing also the trickery with the AB split testing java script. And we weren’t able to get good experiment running on that. So short story is that I think it’s really hard to do, it’s difficult to do. So I don’t necessarily know if we can, we hear a lot of kind of just second hand feedback from people, but in terms of data we probably can set an experiment, but we haven’t — it’s a little tricky, and we haven’t probably done as much as we could have to really vet out those numbers. Steve: Yes, just for a little background for the listeners, so Andrew it seems to me at least you have a video for everyone of your product almost, right? Andrew: Not quite we have — let’s say I think we have 300ish products; we probably have videos for our top 50 or 60. Steve: Okay, so maybe those just happen to be the ones that I was looking at. So you haven’t done any experiment to see whether the video on those products did anything to the conversion rate? Andrew: We– no, I mean we haven’t, not in terms of hard data no. Andrew: We get comments from people saying they like videos, that they help them, that they build rapport, anytime you can — somebody hops on and they talk, and it’s actually the shop owner and they get in front of the camera, it makes a big difference. With that I saw a guy in the [inaudible 00:20:46] he just read a bunch of his product videos. I think he had a very successful, it worked out very well for him, I’m glad that it’s a case by case basis, but yeah, I think it’s — I tend to — maybe I’m going too much on assumption here like all the people who — the daily driven people who just exclaim at [heat] spots, unless you are doing a terrible job, I think videos, it’s going to be — [inaudible 00:21:12] to find a word doesn’t really help a little bit. Steve: Yeah, I was thinking that way too, and so in terms of usability you mentioned a couple of things earlier. You want to help more people find the right product for their vehicle, was that a problem on your previous site? Andrew: Yeah, I didn’t even realize it was a problem until I started doing some [Ux] testing. So we were going to be doing this whole redesign, and so I thought well, if we are going to be doing for all these other major reasons I want to make sure we capture any existing usability problems, or address them at least. So prior to designing the new sites we ran a ton of usability tests. We used user testing.com which is a really cool site for $40, you can set up a task and get somebody that you send very specific guidelines for. In our case I said hey, I want someone that makes between 1600k, I want them nearly between 35 and 60 years old. I want them to be in mail because that’s our customer demographic. And here is what I want them to do, I want them to try to find a vehicle — equipment for their, let’s say their [inaudible 00:22:13]. So you could either watch people interact with your site and try to do it. One thing we realized was that almost everybody came to our home page, now like how we just love a place to be able to put my making model, I can do that on auto part stores, why I can’t I do that here. Steve: Okay, so that was a direct result of usertesting.com? Andrew: You got it, yeah. Steve: Okay, and was it just — like did you have a pretty decent sampled size, or was that just one that stood out to you? Andrew: No, so we did, I think — I think I ran about 12 usability tests. I think maybe three or four on mobile and about eight on the desktop. Looking for different things, so it was something that came up multiple times, it wasn’t just a one day approach. Steve: So what were some of these, you mentioned 12 tests, what were some of the different things that you were testing? Andrew: I would have people — a lot of times I think maybe they were just two different tests that we had, but they were with different people to get a broad sample size. But I would say something like; they are coming to the site and say what do you think the site is about? Do you trust the site, why or why not? And then I would say go out and actually find a vehicle, or find the right equipment for your specific vehicle. I wouldn’t say what — I wouldn’t ask for what they were, or maybe I did, I think we did like four schedules, some of the major mix of models, and we split that up among these tests. Go out and find the right equipment for your vehicle and then I want to see how they actually went through the site to find out what questions they had, where they hang up, and from that we made some changes to the new design. Steve: Interesting okay, and so you didn’t send anyone to go look for parts for [inaudible 00:23:55] probably, yeah? Andrew: No, we had somebody come in and did read our guidelines, and they had some little two wheel drive hatchback. And I got a refund on that one because it was totally what was for us. Steve: So what were some of the other pinpoints that you noticed from this usability testing, did you use any other companies by the way? Steve: Okay, so what were some of the other pinpoints? Andrew: Some of the other pinpoints were people who were a little bit confused about what worked with what. So we thought people said well, what — this is radio work with this, and that’s kind of our big value add even before the redesign. But trying to clarify what worked with what and make the copy a little bit easier to other products easier to understand from that standpoint. Another one was that people a lot of times they didn’t want to read all the texts, we had tons and tons of texts. But a lot of times people were scanning and just trying to get a real quick sense of what worked with what, or what the product was about. And maybe it was because they were in the middle of the user test, and didn’t want to start to read it. But I know myself I usually don’t read huge walls of text either, so we added on all the products, we added at least two anywhere from one to three quick bullets that just summarized the product, and the high points, and the really unique aspects of that product in a very scanable fashion with then the detail coming in the text. On the shopping cart page we noticed a lot of the times people are like I don’t know when I’m going to get this, when is this going to come, I’ve no idea. So we built in a shipping engine that will actually auto detect based on their zip code where they were, and then give them a shipping options, and the delivery day, kind of like– well we stole it exactly from Amazon. Andrew: Yeah, so those are few other things that we also built in based on some of the user testing. Steve: Hey everyone I just wanted to take a quick moment to thank FameBit.com for being a sponsor of the show. Now FameBit is the number one market place for You Tube influencer marketing with over 15,000 You Tubers looking to promote brands from beauty, tech, gaming, pets, and more. Now videos start as low as $50 and it’s completely free to post a campaign and receive proposals from You Tubers. Now if you’ve listened to my podcast before one of my guest Emmanuel Eleyae used FameBit.com to make over $65,000 in four months with You Tube influencer marketing, and the best apart is f you use coupon code Mywifequit at FameBit.com, you’ll automatically get $10 off. So go to FameBit.com right now and get famous You Tubers to promote your products now back to the show. Yeah, so and I’m just curious like it sounds like you were doing a bunch of things that were kind of shopping cart [inaudible 00:26:33] right? So what was your target increase in sales, like I remember we had talked before and you had kind of this number in your head, how did you actually come up with this number? Andrew: The number– so the number I had in my head before I was shooting for a 50% increase. Andrew: It is huge, and that’s when I saw on the last time we redesigned the website, we went from Zen Cart to Magento, maybe it just the fact that– actually I was encouraged, so we started on that. It was our old, and was just so hideous, it was awful, run before a time before like descent templates even existed, so but we had a 50% bump in that case, and so I thought we’re going to invest quite a bit more in this one, I think it’– and with the mobile aspect I think it’s part of the reason whether we can get at least 50%. So more of anything it was just a rough estimate that I kind of threw out there, and we didn’t quite get that, maybe I’m jumping ahead here Steve, but we hit right around 40% increase. Andrew: In conversion, based on the redesign, but it was closer to what we were hoping for. Steve: So what do you think contributed the most to that number? Andrew: I think it was the mobile, and we had the majority of our traffic like a doubling of our conversion rate of most of our traffic, or not most but at least roughly half of our traffic, so the biggest jump overall came from mobile for sure. Steve: Okay, and in terms of like the usability– so I noticed from your new site there’s this nice selector where you just enter in and you make and model your vehicle, and then you’re instantly taken to certain parts that are compatible with that, right? Andrew: Yap, you go it. Steve: So did that make a huge difference as well, I don’t know if it’s hard for you to quantify these things? Andrew: Yeah, that’s a good question, and that’s something that I haven’t– I need to dig into and probably spend sometime in the analytics looking at. I haven’t done as much post analysis on the reasons as I probably should have, that’s a really good question, and I don’t have a good answer for you. Steve: Okay, so do you actually miss any features of Magento that you don’t have with Shopify and vise versa now that you’ve made the switch? Andrew: That’s a good question, let me think about that. Any features we miss, I don’t think so, I can’t think of any– I’m sure that there’s a– I mean you obviously don’t have quite the tweakability of things if you want change something. Shopify is pretty customizable, but at the end of the day you don’t have access to the root code, you know the underlying source code for everything. But I can’t think of anything that we haven’t been able to tweak on our side, and were– be able to extend with an app that I miss from Magento. Steve: So that kind of implies that you weren’t really doing anything super custom with Magento, right? Andrew: We were doing some things custom, not crazy custom though. We had custom plug in, so we had a few custom things that we had developed, but for the most part no, it was a 90% stock and the extension stuff that we were running. Steve: And just in terms of cost, I’m just a little curious how much did it cost you to run your Magento site versus what you’re paying now on Shopify? Steve: Yeah, I mean this isn’t a Shopify ad obviously, but I was just curious without whatever special dealers you might have with them like how much would have been paying as a regular user versus what you used to pay on Magento? Steve: Do you want me to tell you how much I pay? Andrew: Well, one of the things we were paying for Steve was Magento it’s just– I’m not a huge system admin, and there had been a couple of times in the pat where stuff went down the tubes, and I was trying to reconfigure a Unix server and pull my hair out. So we sprung for the racks based server managed hosting service level. So I would call the rack space at 4am in the morning and get someone who’s really knowledgeable about Unix could log in my box and do anything, so that’s mostly what we were paying for. Steve: Are you using any special plugins or? Andrew: We’re using– what are we using yeah, we’re using one that helps us with– that’s a good point, so yeah we probably spent maybe $100 in plugins per month, so it will be $300 total. Steve: So it sounds like the monthly cost is comparable mainly because you were running Magento which requires such a huge server cost? Andrew: Right, yeah I mean yeah exactly, kind of Shopify their opportune on plus plan versus Magento it comes a little bit below. Steve: Okay, so let’s switch gears a little bit and just talk about drop shipping in general, because you mentioned earlier that most of your products are still drop shipped on Right Channel, right? Steve: Are you selling anything on Amazon? Andrew: We’re not, just because most of the stuff that we sell is stuff that other people make, and I think that’s a really hard game to play on Amazon. Steve: Okay, and also with would your margins be kind of conducive to selling on there? Andrew: No, they wouldn’t be, I mean I think if you’re going to be on Amazon let’s say you’re looking at 15% right off the bat for a listing fee, and our margins are– they’re north of that, but not by a crazy amount so. Steve: So one thing I’ve noticed with a lot of people is they kind of start out drop shipping, and then they end up carrying inventory for some of their best sellers, right, have you considered moving more towards an inventory model as opposed to peer drop shipping? Andrew: Yeah I have, I’ve looked into it, and it’s tough, because our niche for whatever case on the radio side you don’t just get big price breaks going straight to the manufacturer. I contacted them and let’s say a radio that cost us $80 to buy wholesale and drop ship, we would get it for like $75 in stock, with like a $20,000 minimum purchase. Steve: Twenty thousand dollar minimum purchase, okay. Andrew: Yeah crazy, so if they’re giving us a 50% price break yeah it makes a lot of sense, unfortunately it didn’t for that line. And some of the other ones too like our major antennas and some of our mounts and things going directly to the manufacturer we can buy them at the same price our wholesaler gets them, but when you look at it that the price to– the cost to open a warehouse, staff it, run it, they would, you know, they’d be just as much if not more than the savings you get on the margin side. So normally that’s one of my regrets about this business, it’s not a business that is one you can scale up really well with additional capital, because you don’t just get the price breaks unfortunately. Steve: Interesting, so they’re kind of encouraging people to drop ship their products then with that pricing? Steve: Yeah a little bit at least my firm yeah, maybe not increase them and drop ship, but it sure isn’t a whole lot of incentive to buy direct from the factories. Steve: Is that just something that’s kind of unique to your industry probably you think, or have you found that other people that you’ve encountered whether be on your forums or what not have gotten significant price breaks from carrying inventory? Andrew: I think that’s fairly unique to this niche, I think in most cases there is a decent case to be made for being able to bring inventory in-house, get those price breaks and be able to increase your margins, but yeah so I think that’s something that not across all niches, but I think it’s more from the not that’s the case you can do it. Steve: Okay and you actually run one of the more successful drop shipping stores that I know of, so how do you– like what’s your strategy for just continuing to grow your shop, and how do you made it so successful this far? Andrew: Yeah, in terms of the really– the success aspect I think it comes down to the niche, you have to be really careful about finding a niche where you can add a lot of informational value, where there’s a lot of friction post or pre purchase, where there’s a lot of accessories and things that people are confused about what to buy, and so we’re really acting as a guide on what different components to buy. If you try to drop ship one or two high tech priced items that’s really-really hard to do unless there’s really strong pricing guidelines in place like a map pricing from the manufacturer. So in terms of continuing to grow it that’s when something that has been a little bit difficult in the later years thinking through how to push past kind of the low seven figure mark has been– I mean we kind of stalled out at different points around that right around the million dollar mark. And so it’s tricky, it’s a niche, I think that’s something that people in different businesses– niche businesses, so is the question like well are we stalling out because we’re really getting to a point where the additional value we get in terms of what we put back into the business you hitting a point of diminishing returns, or are we just doing marketing wrong and then I think that’s a tough question to answer sometimes. Steve: Let me ask you this, are your products– can they be found on Amazon? Andrew: Some of them can, yeah I’d say a lot of them can yeah. Steve: And so in terms of pricing what are you doing– are you matching Amazons prices, or are you lower, are you higher? Andrew: We’re definitely higher, we definitely do a premium or kind of a premium site for the niche, so we’re definitely if at or above Amazon pricing. Steve: Okay and so do you– it’s probably really hard to tell, but has Amazon affected your business in any way since they sell some of the same products? Andrew: Yeah, a great question. I think they have, I think Amazon has affected pretty much anyone’s business selling stuff that’s just a commodity which is more or less what we sell. It’s hard to say for sure but yeah, I think we’ve definitely been a force in terms of making growth a little more challenging in the coming years, and the last couple of years and also making customers more price sensitive too. Thankfully we tend to be pretty good about getting stuff out the door and getting it delivered, pretty much anything over $75 ships for within– it gets two to three days free delivery for our customers, which is nice because that’s a way we can kind of competing against Amazon even from non prime members which is great. But yeah, people– hard to say for sure, but I think it’s definitely been a force that we’ve had to deal with. Steve: Let me actually rephrase that question a little bit. So what are some of the things that you are doing to kind of address Amazon? Andrew: I think the two things we do, I think the one thing we do the most is just try to really specialize and make sure that people know that if they buy from us, they are going to get components that are much more likely hopefully guaranteed to work together, because amazing is great at carrying internal products. It’s really bad at being able to at least for most products, really spend a lot of time and dive deep into the specifics of one product line. That’s the only reason we are able to stay in business Steve and be able to make money, is because we know these better than anyone else. And secondly, there’s friction in purchasing on Amazon versus our site. So our equipment and our packages to outfit your vehicle with a radio, you need like five or six different components, and you are [inaudible 00:38:31] radio, media all the stuff. You shop at our site where it’s all geared towards that, you know everything works together and you’ve got the shopping cart, five items or maybe you’ve got a package we’ve put together that has five items for this funky skews on it, which may or may not match up with the skews that the manufacturer uses. You go to Amazon and try to price compare this, it’s a royal pain. Maybe you can’t do it, but maybe you can’t find a couple of them, you can’t find similar ones, the names are different, you are not sure if they are exactly the same product. So yeah you can go over and compare a different shop, and maybe get three quarters of the basket in there, but it’s a pain, it takes time. You’re less certain it’s going to work, and you may not be able to find the exact comparables. And that friction makes it I think more likely for people to stick with us and buy from us. Personally I would rather pay 10% more, or 50% more to buy from somebody who knows exactly what they are talking about, and not have to spend half an hour hoping I get the right thing, because whatever value add is, people getting a box, being able to install it, and know they are not going to have to spend two weeks or a bunch of time returning equipment that doesn’t work. Steve: Yeah I know. I totally agree with your assessment. I find that Amazon is actually a really lousy place to shop for anything that’s even remotely complicated, right? I remember I was shopping for some computer parts the other day, and I wasn’t sure the compatibility, I actually had to go offsite, because Amazon is just a listing of products. So I almost feel like in order to be successful in drop-shipping, you almost have to go into something that’s a little more complicated, would you agree or? Andrew: Oh absolutely. You have to go into something, you got to have a niche where you have some kind of value added information related if you are drop-shipping. Or the only other two things I think makes sense is if you can get an exclusivity which is hard to get for drop-shipping, or if you have a company that– or a product or a manufacturer that maintains really stringent like MAT pricing. So they put a– they have a floor on their pricing. If that’s the case, then you can get something that– but even then still you still want something that has a little bit of complexity or confusion around it, because the only way you are going to beat out Amazon is to be able to be someone who people trust more, you provide more information in and you’re as the expert. Steve: Let me ask you this question, do you find that the manufactures themselves that you source products from, are they selling directly on Amazon? Andrew: No, they are not. Thankfully they are not. If they start selling directly on Amazon, that’s going to be– yeah that’s definitely going to be a huge problem. So at the moment, they are not. They are selling to people who sell directly on Amazon, but they themselves aren’t selling on Amazon. I think they do that because they don’t want to alienate their distributor network and their retailers. But at the moment they are not. Steve: And I’ve also noticed that if you try to source anything from the US, vendors tend not to like the fact that you are going to just list them on Amazon. I don’t know if you’ve noticed that? Andrew: Yeah, I mean it’s because it kills– most of the people who list on Amazon are going to kill the price, they are going to just drive the price into the ground. We actually– one of our major radio manufactures recently just came out with the policy that they are not allowing any of their third party retailers to sell on Amazon anymore, because they were taking the product that previously had a pretty descent price margin, and you get all these people– it’s the same problem you have at drop-shipping. You get all these people, they buy much of stuff, throw on Amazon FBA, and there’s not a lot of incremental cost in terms of fulfilling those orders apart from their refunds and things that come back, and so the price just gets driven into the ground. So that’s why I think why manufacturers don’t like it. Steve: So in this day and age with all these different things going on, like how would you approach a drop-ship vendor to convince them to sell you their products in this day and age? Are you still there Andrew? Steve: Does that question make sense? Andrew: A little bit, did you mean in terms of approaching like a new drop-ship supplier? Steve: Yeah, approaching a new drop-ship supplier with nothing. Let’s say you didn’t have Right Channel Radios, and you started out with nothing, like what would be some of the things that you would say to convince a drop-ship vendor to actually even drop-ship for you? Andrew: Is this someone that is already drop-shipping for other people? Andrew: So that’s going to be relatively easy I think. I think if they are drop-shipping for other people you just have to come across as not someone who’s going to waste their time more or less. Usually a lot of times, it’s is just as easy as saying, “Hey can I drop-ship for you?” They say, “Yeah great, fill this application, we are good to go.” If it’s not, if they have a little bit hesitancy, one thing you can do is say, “Hey, do you mind if– I’d love to drop-ship for you. I know you maybe get people that come in here and tire kickers that waste your time and they never end up buying anything. Here’s a check for a $1000, cash it, put on credit for me. So I mean I’m guaranteeing that I’m going to give you some business, and then for my first thousand dollars in orders just debit it against that credit that you have.” And then you let people know that you are serious, that you’re actually are going to do business with them, and you need to be, but it’s a way that can work. Steve: That’s a very good tip Andrew. Cool. So going forward actually, I was just curious, would you be recommending people go into drop-shipping, or other means? Andrew: No I mean it’s– personally I’m starting to look into– we were talking right before we got on about some of the stuff we are developing right now that’s a proprietary, that’s our unique products. That’s where I’m headed personally where I’m looking to. I think you can definitely of course still make money with drop-shipping. Our radio site is still our bread and butter site, Right Channel Radios, but I think it’s getting the niches for– that drop-shipping make sense for, and what’s viable are getting smaller and smaller. They still exist, but they are getting harder and harder to find. The risk to reward ratio is also a little bit lower. I think for a long time still it will be a great way to supplement our existing product line. So if we go out and start developing our own line of something of products, it’s hard and especially as a smaller ecommerce entrepreneur to go and develop your hundred proprietary skills. That’s tough especially if they are really unique. You develop a dozen or half a dozen and those are really valuable, and you supplement those with drop-shipped items that can really help complement your offering. That’s a nice little marriage in my opinion. Steve: Cool, man, hey Andrew we’ve been chatting for quite a while now. I want to be respectful of your time. I also want to give a plug for you, eCommerceFuel live which is Andrew’s conference which is coming up. I will be there and a whole bunch of other people going to be there that are all vetted. I think your way of requirements is like 100k in revenues or something like that? Andrew: Yeah, minimum 100k in ecommerce revenue, or be a professional on this space. Steve: Yes. So it’s a very great conference. I highly recommend that you guys check it out. I don’t want to do the plug for you Andrew. But where can people find you? Andrew: You are doing great. Steve: It’s all solicited by the way, I’m not sponsored by Andrew in any way. Andrew: Well thanks Steve. We would love to. We’ve got about 15 tickets left. It’s capped at a hundred people, we try to keep a more [inaudible 00:46:17] environment, and if you are interested you can learn more, see the video from last year. We should have the full agenda for speakers and the breakout sessions up in the next couple of days here at live.eCommerceFuel.com, and you can see all the details there. Steve: Sounds good Andrew. Hey thanks a lot for coming back on the show man. Andrew: Steve, it’s always fun, thanks for having me. Hope you enjoyed that episode. What I like about Andrew is that he’s constantly working on improving his store. He runs one of the most successful pure drop-ship stores that I know. I’m actually in the process of redesigning my own shop as we speak, and I hope it gets the same results. For more information about this episode go to mywifequitherjob.com/episode86, and if you enjoyed this episode please go to iTunes and leave me a review. It’s by far the best way to support the show and please tell your friends, because the greatest compliment that you can give me is to write a referral to someone else either in person or to share it on the web. Now if you’re interested in starting your own online business be sure to sign up for my free 6-Day-Mini Course where I show you how my wife and I managed to make over 100k in profit in our first year of business. Go to Mywifequitherjob.com for more information, and sign up right there on the front page. Once again I also want to thank BigCommerce for sponsoring this episode. BigCommerce is one of the best shopping carts that I recommend if you want to start your own online store without having to worry about anything technical. So everything from design, to sourcing, to payment processing, is all built in, so all you got to do is populate it with the products you want to sell and you can literally start your store in a matter of hours. Simply go to BigCommerce.com/Mywifequitherjob, sign up and you’ll instantly receive one month free. Once again the URL is BigCommerce.com/Mywifequitherjob. I also want to thank HostGator for sponsoring this episode. HostGator is one of the best webhosts out there that I recommend if you want to start a blog. And in fact I hosted Mywifequitherjob.com on there in the very beginning and loved it. You get 24/7 live support via chat, phone, and email, you can install WordPress in just a single click. They’ve got an easy to use website builder, design services, and the best part is that I’m offering a 30% discount for all podcast listeners. So go to HostGator.com/Mywifequit to redeem the discount, once again that’s HostGator.com/Mywifequit to save 30%. Thanks for listening. Outro: Thanks for listening to the My Wife Quit Her Job podcast, where we’re giving the courage people need to start their own online business. For more information visit Steve’s blog at www.mywifequitherjob.com. Great interview, Steve, and thanks for making the transcript available. Andrew made some important points about accommodating mobile users, and providing an expert guiding perspective for product lines with complex choices. Scalability of certain product lines was also good takeaway.